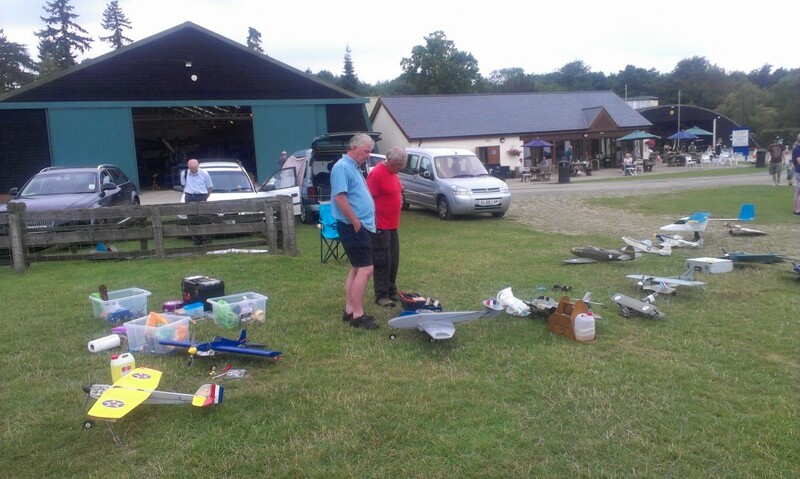 Please note: all placings and timings are provisional pending confirmation by the Contest Director – and a few of the static model pictures were taken at other events! 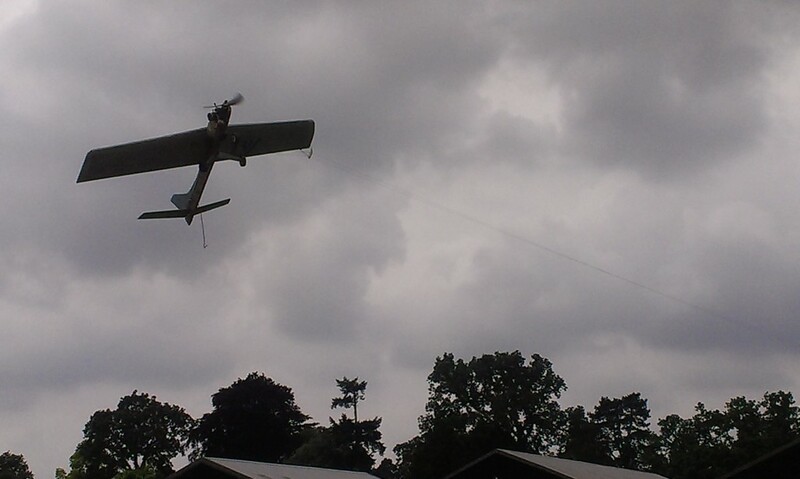 Over the weekend of the 19th and 20th of July Old Warden saw another great ModelAir Scale event, featuring every kind of classic model aircraft flying, a massive trade stand area, and of course visitor access to the famed Shuttleworth collection of vintage aircraft and vehicles. 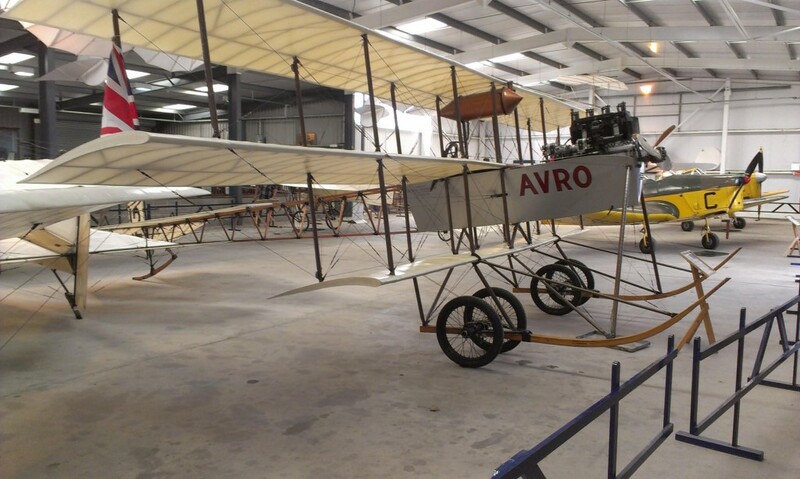 There was a special emphasis upon the commemoration of the 100th anniversary of the first World War, resulting in the nostalgic sight of many excellent biplane and triplane models flying during the show in almost every class. 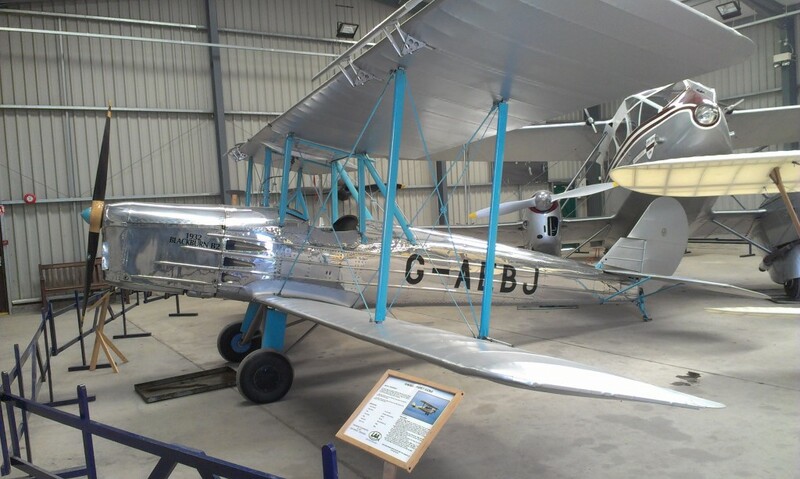 For those seeking respite from the sun, or from the sound of angry glow-motors, the gorgeous full-sized airworthy planes of the Shuttleworth collection were just across the road to view and admire, while the cafeteria was a brief stagger away for tea or iced drinks – pure heaven! The 15 Carrier pilots who attended were delighted to see that the weather was set fair for their visit to HMS Incredible, which was safely docked on her temporary berth in front of the Old Warden hangars. Andy Housden and his dockyard mateys soon had her bunting flying and arrester wires set up for business, with Andy’s essential timing and photographic gear primed and at the ready for use. Flying Control (‘FLYCO’), the throbbing heart of Air Operations! Air operations began at 10:00 and went on until 18:00 hours on both days, with no need to finish early to accommodate full-sized fly-ins, as was the case at the May meeting (and the cause of some firm exchanges of view between the grounded model flyers and the pilot of the full-sized plane responsible!). 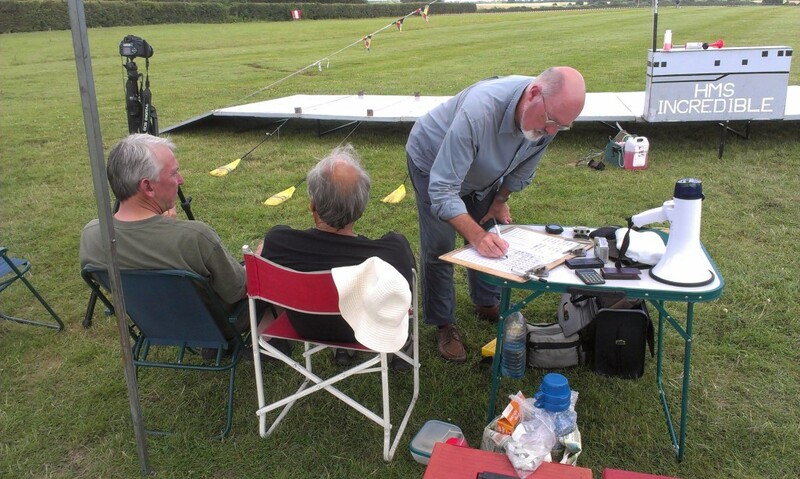 I arrived around midday on Saturday to find John Phillips taking full advantage of his electric Sea Hornet’s maximum wing area, low aspect ratio wing and the light breeze to score a very good 226.2 points, which eventually proved enough to net him second place overall. I murmured to myself “Electric must be the way to go!” on seeing the ease of throttling and startling lack of starting troubles John had – prophetic words indeed, as I was to find out later! Next up was David Cowburn (of the eromodeller Magazine ‘EeZee’ free plan fame), who has an ongoing love-affair with the Lockheed U2 in both Carrier and stunt, usually scoring well at every meeting. Powered by a relatively small SC32 engine, he zipped around for a consistent 27 seconds for the high speed sector, but his slow speed laps were rather fast and only good enough to secure 156 points in total for his best Saturday flight. For connoisseurs of the unusual, Brian Hunt has campaigned his very pretty Boulton-Paul Balliol this year, with an Irvine 40 in the nose. This model was originally built to compete in profile scale competitions, and the detailing, paint and finish are a joy to behold. As yet, however, Brian hasn’t managed to complete a scoring flight. It must come soon, and he deserves it for giving the rest of us something to aim for in terms of presentation! On Saturday, a couple of attempts proved unsuccessful yet again – keep trying, Brian! Talking of Andy, he was next onto the deck with his very battle-scarred Seamew. Looking at the repairs, bends and bashes that this aircraft proudly displays will transport you back to the days when aircraft staggered back to their mother-ship, shot up and beyond repair, to be dumped unceremoniously over the side to clear the deck. Well, no such fate has befallen this old warrior! Despite serious wing-warps that should send her straight over Andy’s head on the upwind segment she still performs exceptionally well, and of course Andy is a great pilot, regularly clocking over 200 points. Having over-sold Andy and his Seamew, fate and some kind of ill-intentioned gremlin present throughout the meeting (just look at the number of ditchings!) conspired to rob Andy of any landing points, leaving him with just 104.00 points to show at the end of the first day’s flying. 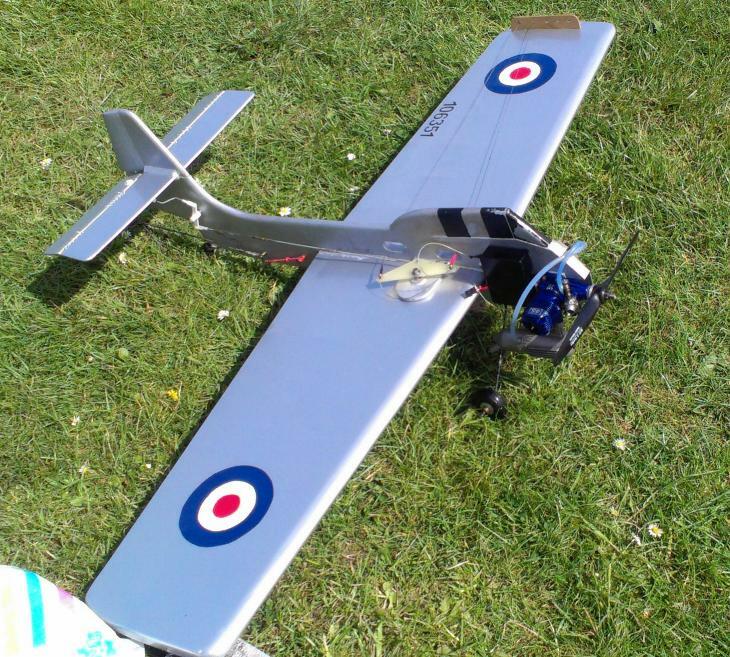 Andy Housden’s Seamew – just look at the adverse warps in the wings – but it flies so well – how does he do it? 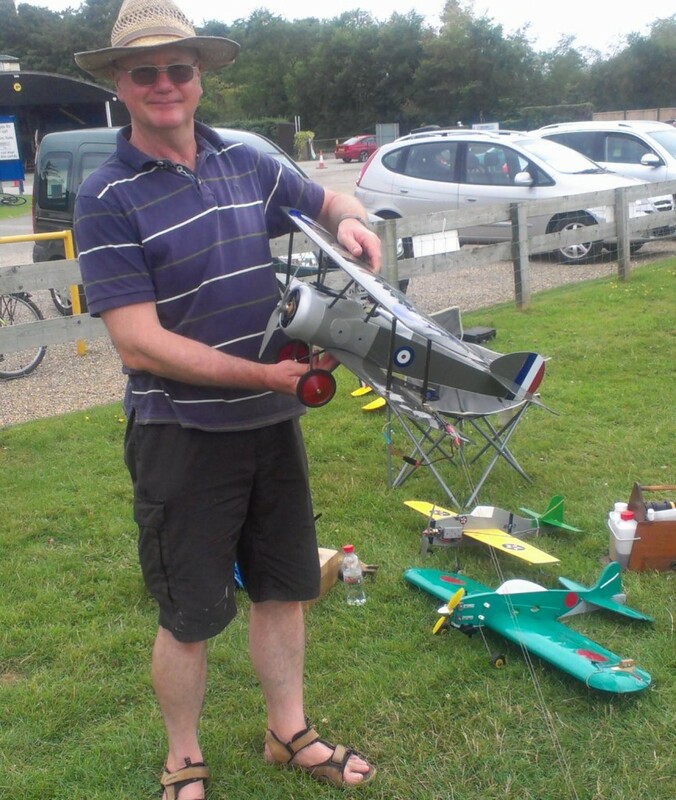 …I did the same with the MO-1, and Chris Howells made it a hat-trick with yet another zero score for the Corsair. 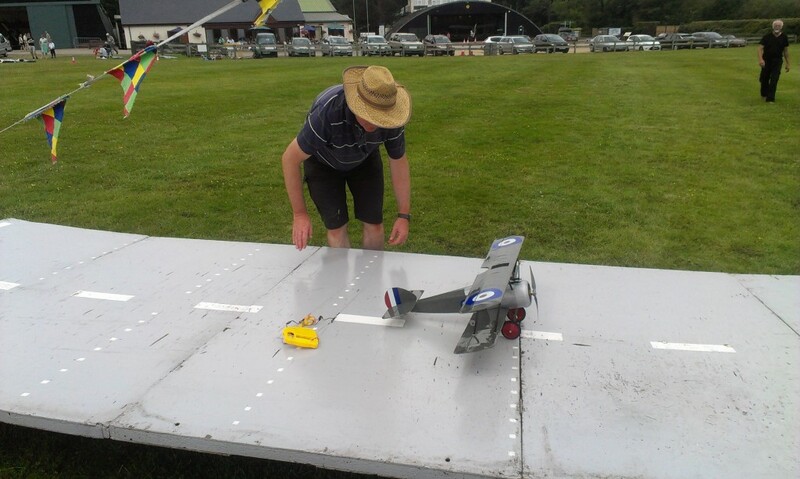 However, Chris was determined to get SOME points on the board, so flew his WW1 Commemorative (WWOC)-class Sopwith Pup for the first time competitively; he did really well too, scoring 97.6 points with his nicely-crafted, TT15-powered biplane – great stuff, Chris! That ended the flying for Saturday, so your scribe loaded up the car with his three zero-point models and went off to sweat the night away (it had been a very hot day!) wondering how on earth he could get onto the score-board! Sunday’s weather was clearly going to be a repeat of the day before, although the wind had moved through 180° overnight. Answering the Captain’s call to re-berth the ship, his stalwart dockyard mateys gathered round the deck, and on the old navy shout of “Two-Six!” heaved-ho and shifted HMS Incredible to her new mooring. 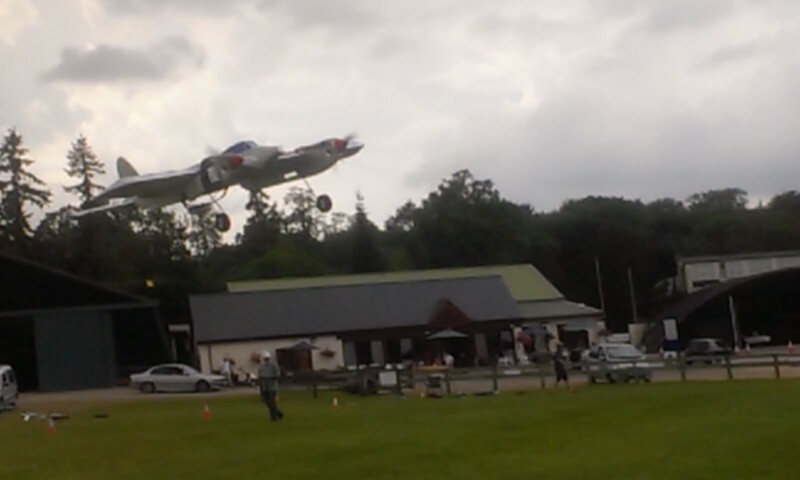 First away was Peter Tribe with his Meteor III, putting in a set of very competitive flights. After a relatively slow first seven laps on flight 1 (30.3) he opened up the twin electric motors and recorded 25.8, which together with 69.7 for the loiter segment proved to be the his best flight, scoring 220.6 for what would turn out to be 3rd place overall. 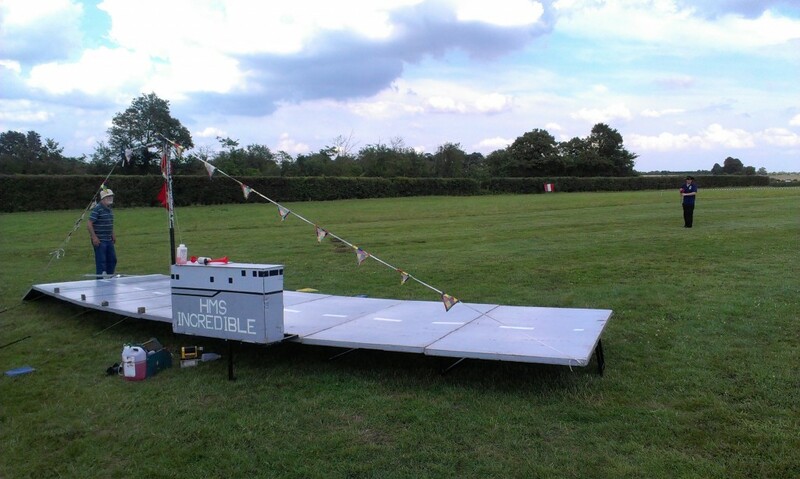 One of Peter Tribe’s electric Meteors – superb fliers! 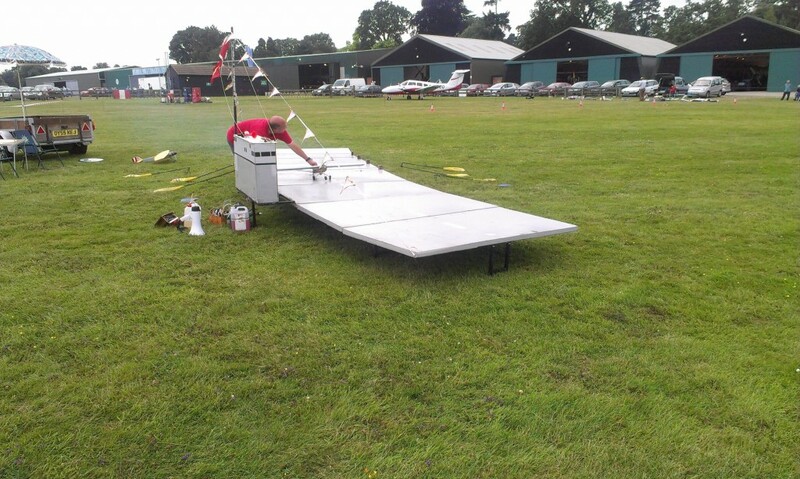 Fred Skinner’s Seamew was ready to go as soon as Chris cleared the deck, and impressed with an initial no-nonsense flight clocking 36.6 and 101 seconds for the two segments, nicely finished by a perfect landing. This would have been rewarded with 8th place overall but for two overshoots (his second flight was aborted early), leaving him in 9th position. This was just behind the ever-creative and forthright Mike Welch from Marlborough, who was next up with his beautiful 4-stroke–powered Sopwith Pup, which was competing in the WWOCC class as well as BCD.Mike’s first flight was called as an attempt, his second scored a very creditable 132.8, but his third flight has to be rated the best flight of the meeting, netting 181.4 (42/104) points, and remember: this is with a full-fuselage biplane, a four-stroke engine, and in a new class. Hats off to him, and to Andy for the great idea of flying to commemorate the Great War and the pioneers of naval aviation. The next model, David Cowburn’s U2 again, contrasting brilliantly with the Pup, symbolised the truly amazing technical advances in full-sized aviation and carrier flying over the past century. The prototype U2 was designed in the late fifties, and flew throughout the Cold War on spy flights across the Soviet Union, and is still in use today (albeit in a highly developed version) to reconnoitre the world’s trouble-spots. It’s not widely known that it also flew (?flies?) from US carriers where the mission distances demand pre-positioning before take-off – nothing is known for sure as the pilots of these machines are members of the CIA! What is definitely known is that David does very well with his U2 and is usually an expert at getting the best out of it, although this meeting proved problematic by his high standards. He was unable to improve upon his Saturday best of 156 points, chalking up a ditching and two zero-point arrivals for a high of 60.7 over his three attempts. The next two flights (by your correspondent) are best forgotten, as he tried his uncooperative MO-1 and sulky Wildcat. An attempt with each clocked up the dismal total of half a lap in flight (MO-1) and a ditching straight off the end of the deck (Wildcat) as both engines cut out as soon as they felt air under their models’ wings (later diagnosed as being due to contaminated fuel). 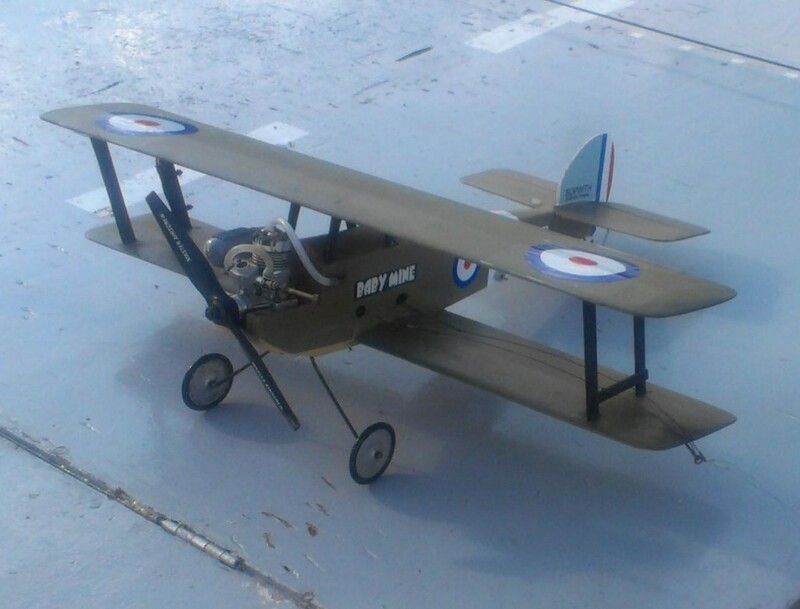 This left the carrier’s deck ready in unexpectedly short order for Andy Green’s stunning-looking WWOCC Sopwith Camel, completed the night before after a lot of work over the past weeks converting an R/C scale model kit. It hadn’t been flown, and there was a feeling of trepidation in the air as he checked out the electric motor and radio throttle – he’d elected to land without the use of an arrestor hook as per prototype, so the deck was cleared, and the motor revved up and off she went. 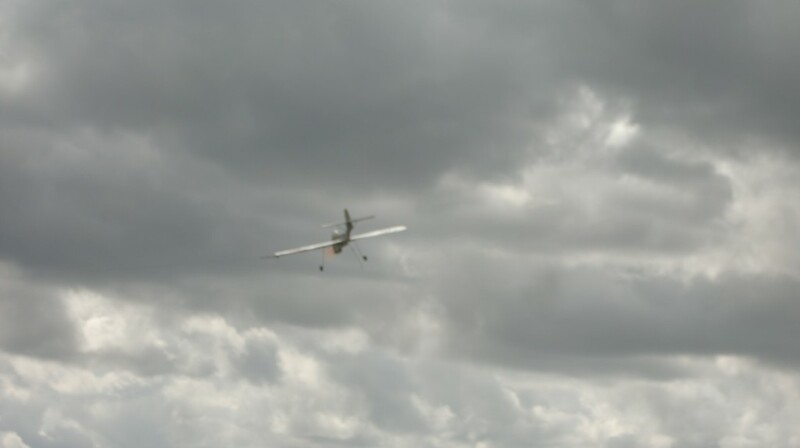 There’s a VIDEO of Andy’s two flight attempts, the first of which ended in a heavy ditching, and the second of which wrote the model off after a complete loss of control, due (Andy thought) to light weight, over-sensitive controls and a rearward CoG, exacerbated when the model went into the wind. I think I speak for everyone who watched the model pile in the second time that Andy didn’t deserve this after so much work and effort to support the event, and that his philosophical approach to the loss of the model was the mark of a true aeromodelling enthusiast and a gentleman too. 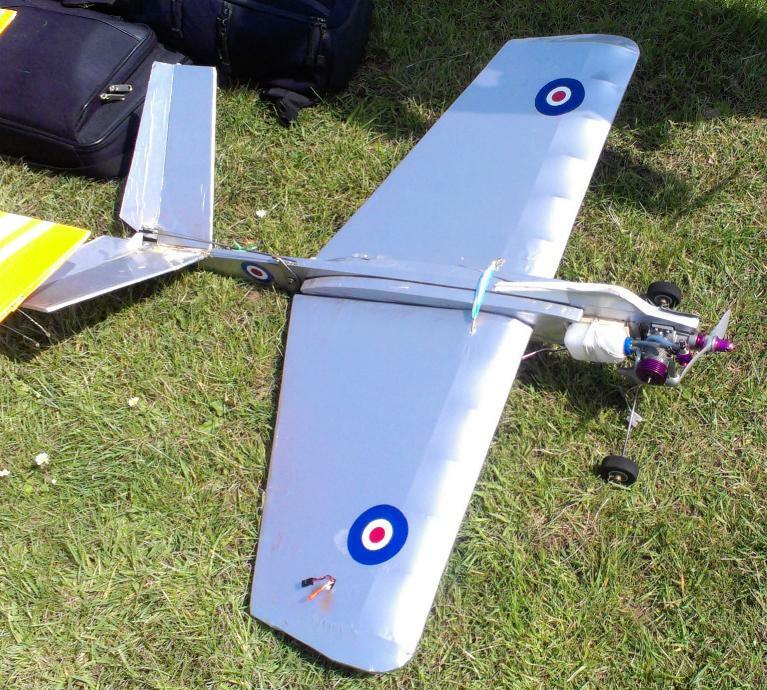 He then wheeled out his Housden Hellcat for his third flight, but after a rapid 26.9 for the fast section, he ditched and was DQed – again, not a brilliant day for him. 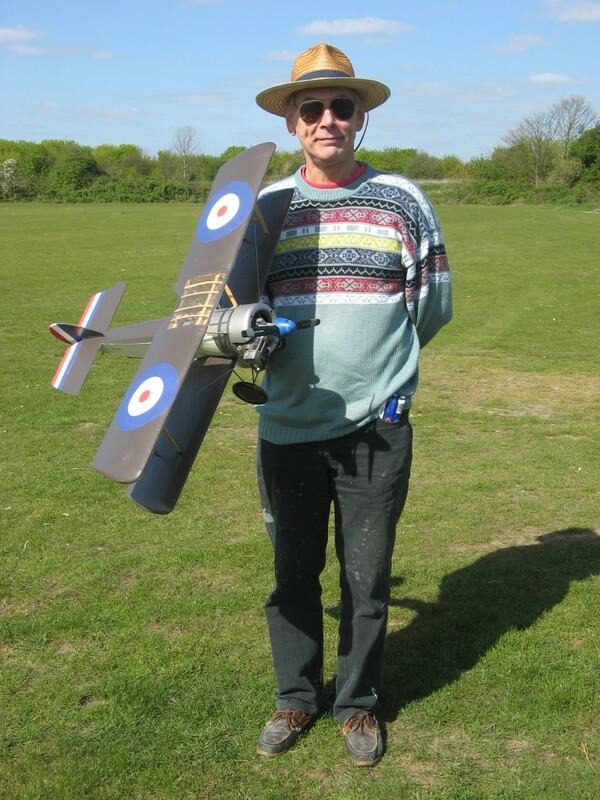 …and talking of Top Guns, one of the most consistently excellent fliers in the UK was next up – Ian Gilbert – and he’s now the NATS BCD Champion too! 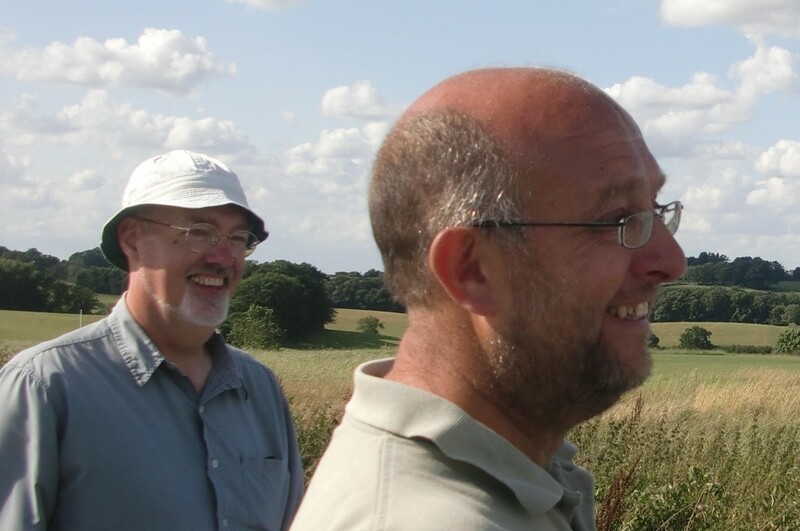 Ian and Andy share a joke – maybe my flying antics! Ian is clearly a fan of SC engines, with his Westland Wyvern featuring a 32 and his Fairey Spearfish powered by a 25. The full-sized Westland prototype was another “might-have-been”, its service potential wrecked by unavailable/unreliable turbo-prop engines and constant MoD design changes. This certainly can’t be said about Ian’s model, cruising at a fairly leisurely 38.5 for the fast sector, but really showing how it’s done on the slow with 152.5 – overall, a flight worth 234 points. 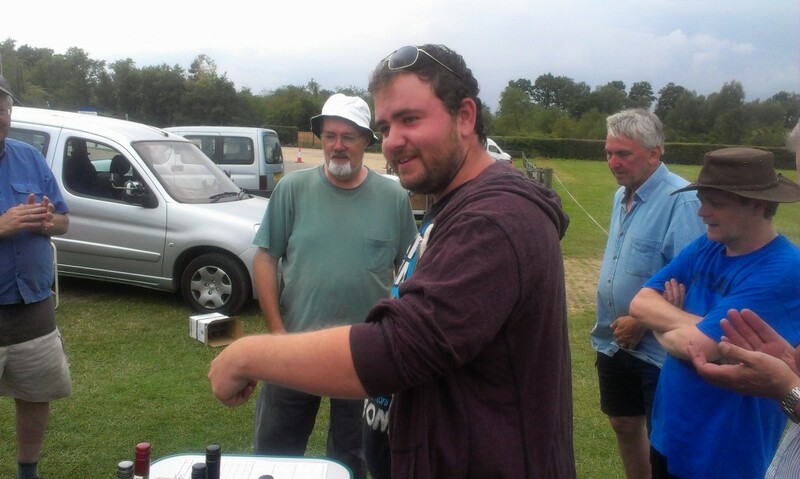 Not content with this, Ian hooked up his Spearfish to the lines and showed his almost effortless mastery of carrier flying with a 32.6/153.2 for a best-in-meeting score of 240.6; a third flight just went to emphasise his skill and consistency, yielding 228.5. As Andy Housden said later at the prize-giving, it’s great to watch a master at work, and it’s even greater to see (and hear) these superb flights being powered by “real” (I/C) engines too! The afternoon was wearing on, the heat was becoming oppressive, and the thunderclouds were building all around Old Warden, giving a spectacular backdrop to the final couple of hours flying. 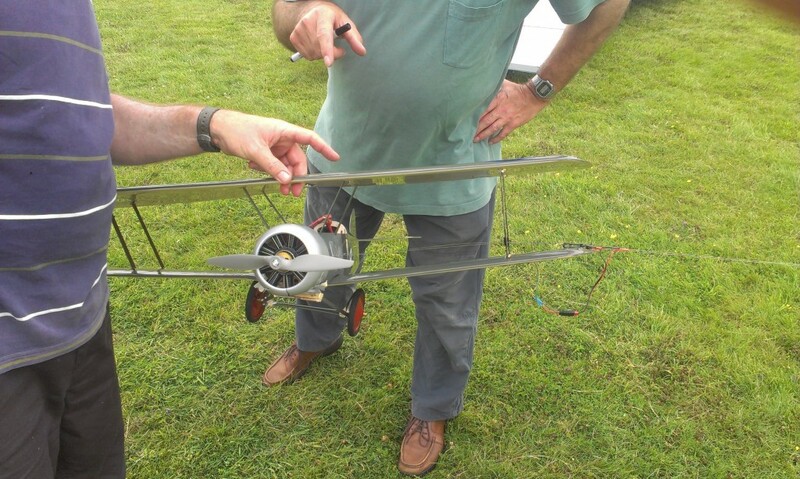 Your correspondent noted the WW1 theme being done full justice by R/C fliers further down the flight-line as they presented a typical dogfight with about a dozen large biplanes and triplanes in a classic Biggles-inspired melee – great stuff, chaps! 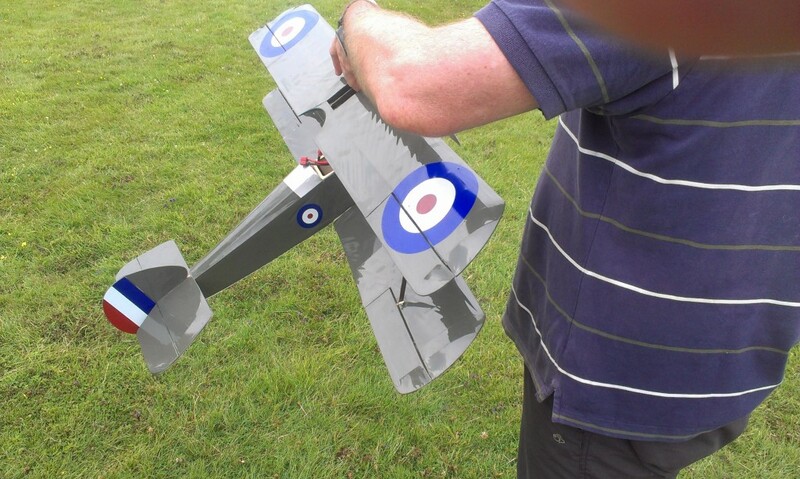 Andy Green is not a quitter, and probably as therapy to get over his bad luck with the Sopwith Camel he flew his Hellcat again, but regrettably without success when it ditched for another zero score. Moving on to his electrically-powered Wildcat for his last official flight he finally got back onto the scoresheet (where he deserves to be) with a flight that logged 29.3/60.7 and an 80-point landing for a personal best-in-meeting of 131.4, which was enough to net him 12th place and the satisfaction of knowing that the weekend hadn’t been a complete write-off competition-wise. 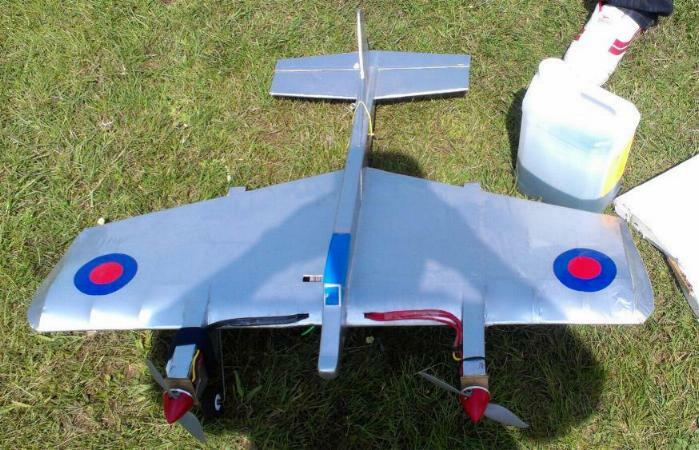 Team Phillips (father Bob and son John) from Colchester have been quietly experimenting with unusual prototypes and configurations this year, looking to take advantage of the maximum allowable wing-area (450 sq in) in very low-aspect-ratio formats. Bob’s Supermarine 508 has the added interest of a V-tail, and I’ve seen it make some very impressive flights with its West 36 powerplant, despite some modellers’ opinion that West engines “don’t throttle well” – hmmm! Bob did try the 508 but wasn’t happy with it, so moved on to his interesting SC15-powered Seamew, flying on 42’ lines (10 laps timed to get consistency with the majority who use bigger engines and 60’ lines). 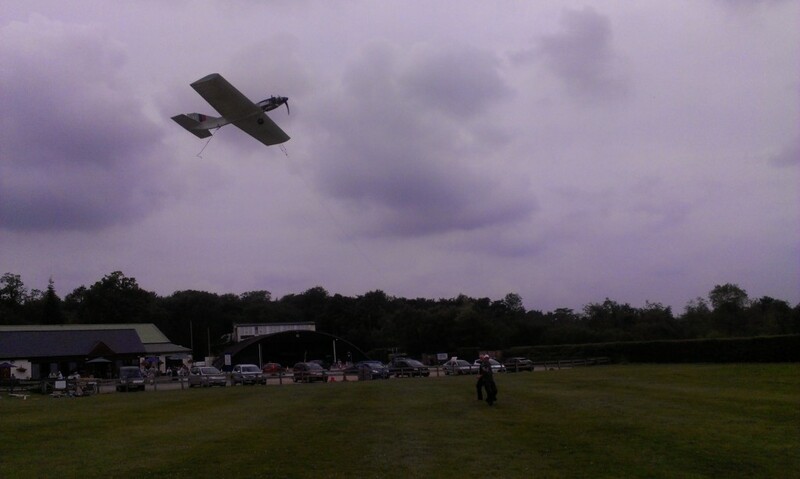 His first flight was a cracker, yielding 37.7/109.1 and a perfect landing for 191.4 points. His third official flight wasn’t quite so good, but made 170.5 points which is not at all to be sniffed at. Let’s get back to Team Phillips! 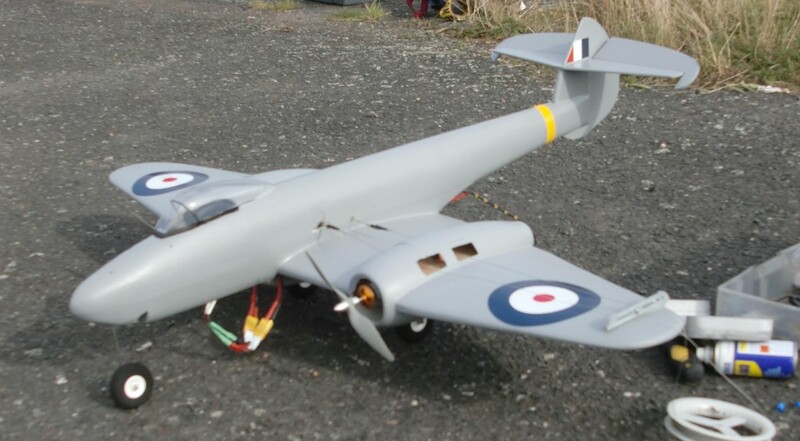 John took the next Sunday flying slot with his electrically-powered Sea Hornet;he flew twice, once touching the “sea” for a ditching, but then turning in a very good 207.8. However, he’d already done better than this on Saturday with a flight totalling 226.2, so the Sea Hornet was taken back to its shore base with a pretty safe-looking second place assured. 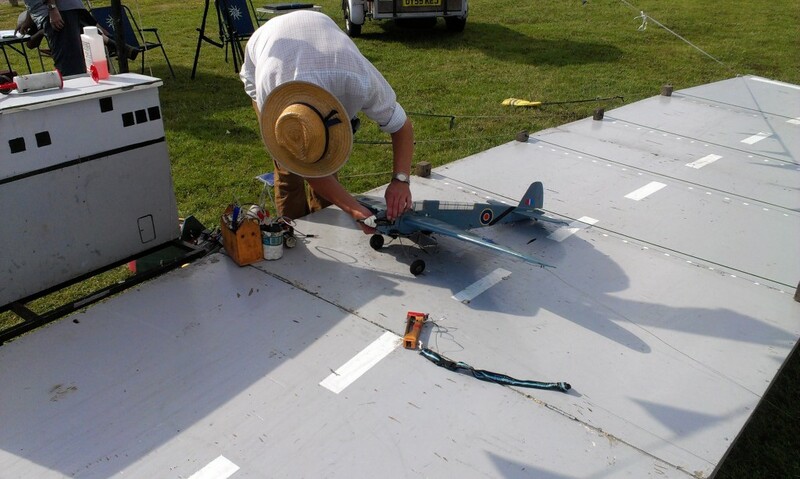 John’s charismatic take on the Sea Hornet – only an XF5U Pancake would have a lower aspect ratio! And so, back to the master of disaster, your correspondent. 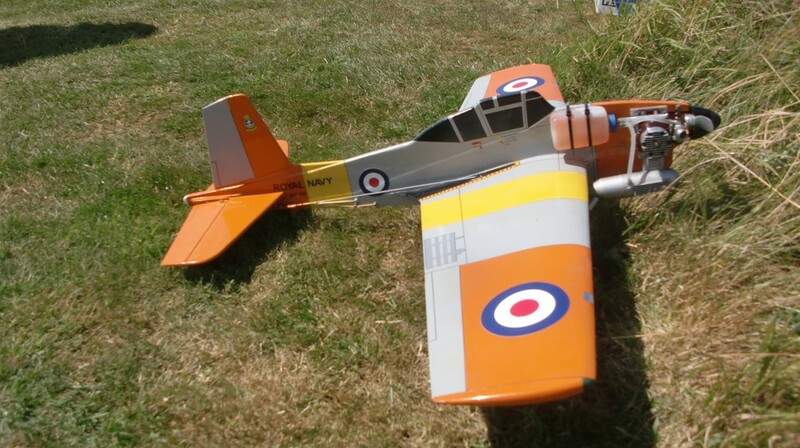 I’d already given up on logging a scoring flight with my models, when Chris Howells very generously offer to lend me his Housden Zero for my Sunday flights. This was above and beyond the call of duty but very much appreciated by me as a 500 mile round trip for a half-lap in the air was otherwise going to be my reward for the weekend. We hooked the Zero up to my lines, which was actually what caused the crash…but we’re ahead of ourselves. Chris’s Zero has a Leo 46 for power, and that is one FAST motor, especially when the throttle, won’t! It stuck wide open after the slow section, leaving me to land flat out – which I did, taking all four wires for a ‘perfect’ landing and 150.6 points. Common sense should have told me to stop there, but I didn’t. 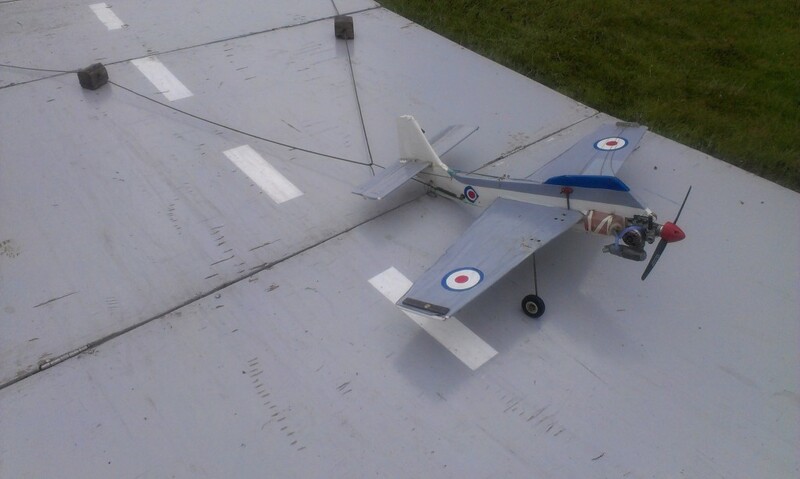 The second flight saw the throttle working properly, but I missed all the wires for a score of 63. The throttle stuck wide open again on the third. 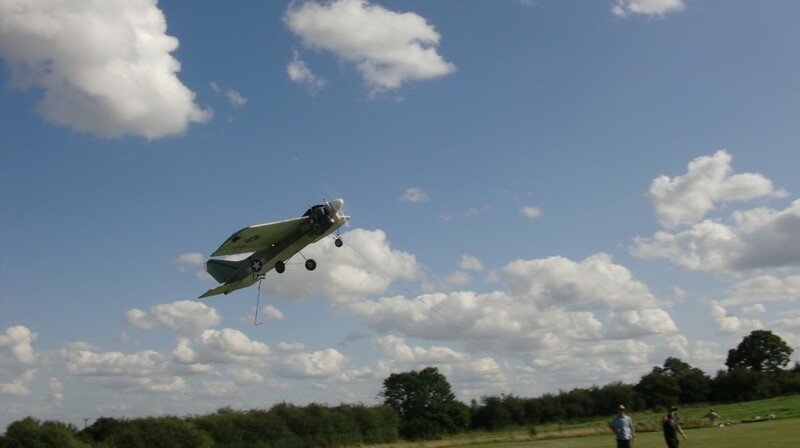 I should have flown out the tank, but instead listened to the centre-circle judge who suggested that I ‘tug on the throttle cable’ to free it up – as you can imagine, with the plane doing nearly 70mph this was ill-advised. The cable snagged the down-line instead, applied an uncommanded full-down-elevator and sent the Zero into the ground at top speed, causing serious damage. Words can’t describe how stupid I felt – it’s bad enough doing real harm to your own model, but to do it to one that a great guy has lent you is heartbreaking – for both of you. Chris is another of aeromodelling’s real gentlemen, and took it as philosophically as Andy Green did his Sopwith disaster. Chris, I’m still feeling rotten about it – nuff said. Ironically, my first Zero flight’s 150.6 points were enough to give me 11th place – richly undeserved, I’d say! 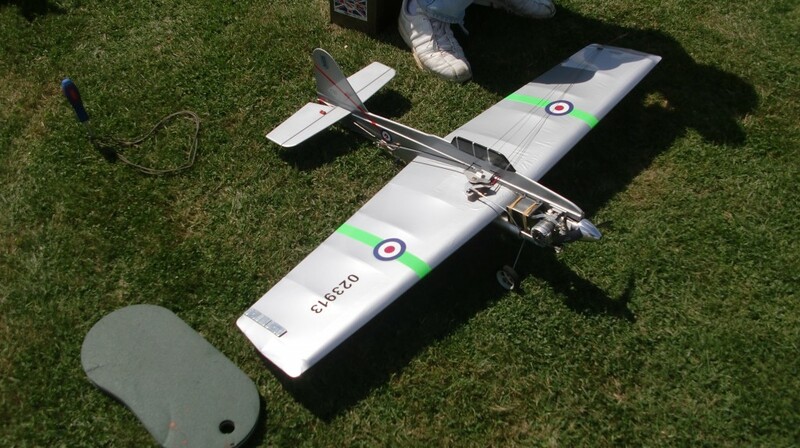 Penultimate flyer was Dave Holmes from the Bilston club with his OS40 powered MO-1. After tearing around on his first flight for a 26.8 fast segment he then did 82.0 for the slow laps, but had four overshoots and a zero-point landing to make just 55.2 points. Undeterred, Dave flew again immediately, this time with very similar numbers but only one overshoot and a perfect landing to round off the flight, netting him 167.9 points. However, one of his flights on Saturday was marginally better (171.9) which gave him a confirmed 9th place. Finally, after two hectic days’ of naval aviation, the deck was cleared one more time for yet another competitor with yet another aeroplane. Roy Green launched his electrically-powered Grumman Guardian from the good ship HMS Incredible without any to-do, and once again proved that slow flight is where the points are at. After an unhurried set of fast laps (34.2) he set to work and followed them up with an excellent 122.4 for the slow section. With a perfect landing, this gave Roy a very respectable 208.2 points and 5th place overall, which is rather remarkable considering that this was Roy’s only flight of the weekend, and the Guardian’s only flight too, as well as being the final take-off and landing before HMS Incredible set sail for the BMFA Nationals – as I’ve always believed, real class will show in the end! 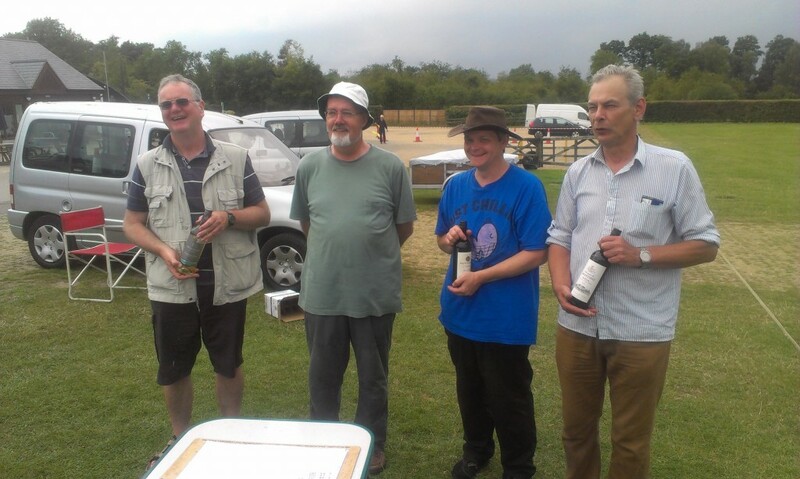 With that, flying operations ceased, the timekeeping equipment was spirited away into a handy hatchback, and the aircrew gathered round for Andy Housden to present the meeting’s prizes – to view full details of all PLACINGS, CLICK HERE, and to view all the FLIGHT DETAILS CLICK HERE. It was very pleasing to see that after so much preliminary work, the WWOCC event had generated enough entries to make a competition, with three of the four actually taking to the air (my plastic Cox-powered Camel refused to start! ), and it was good to hear that this event will continue to run for the same duration as WW1 itself – that’s another four seasons for me to fit a spring starter to the little so-and-so!. Many, many thanks are due to ModelAir, the organisers of the event, the Shuttleworth Trust for hosting it, to Andy Housden for promoting, directing and timing it, to Mike Welch and the Marlborough Club for the loan of HMS Incredible, and all the fliers who came to make it a great two days’ of naval aviation in miniature.